To which the response was, well duh, working with high schoolers are easy! Because once you are in high school, you are most likely involved in the church because you want to be. Middle school is something completely different. Most of them are there because their parents make them…some are there because they want to be. But regardless, how do we move from one to the other? So how do you get the middle school group that does not want to be there and turn them into a group of high school who want to be at church all the time? 1. Most American teenagers have religious beliefs. 2. Organized religion doesn’t matter much to most teenagers. 3. For a significant minority of teenagers, faith does matter. 4. Adolescents are incredibly inarticulate about their faith. 5. Religious vitality differs by tradition. 6. Highly religious teenagers fare better than less religious teenagers. 7. Teenagers mimic the religious devotion of their parents. Now go back and reread that quote from Martinson...then read number 7 again. I remember once when I was in 8th grade, my friend Ben was staying over at my house. We wanted to watch a movie but did not know which one. My sister was heading to Blockbuster to rent something and we requested that she surprise us with a movie of her choice. When she returned, she handed over this weird looking movie that neither of us had ever heard of. We had no interest in watching this thing, the description did not sound to appealing either. What movie did my sister try to force me to watch? Empire Records. But being the good older sister that she was, she proceeded to tell me how it was such a great movie and how much she knew I would like it if I only gave it a chance. I watched it because she was pretty pushy about the fact that I should and to this day, it is one of my favorite movies. 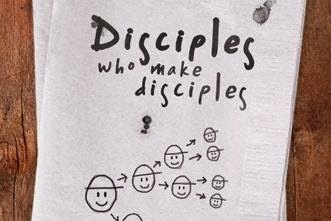 But what does this have to do with making disciples? What my brother-in-law was referring to many years ago was not the fact that working with middle schoolers is difficult; it is because they are not there on their own accord…at least at first. Just like my sister knew so many years ago…watch this movie…I know you…and I know this movie…I know you will like it. Same goes for church. If you regularly attend and are active in your church life, my guess is that it is much more likely that you child will be active the church as well. As the National Study on Youth and Religion states in number seven, teenagers mimic the religious devotion of their parents. If you want to make a disciple of your children, make a disciple of yourself first. How can you expect your child to go to church and think it is a priority if you skip more then you attend? Oh, I was up late…so I will sleep in. I am hanging out with my friends…so I need that time to do my homework. So and so isn’t going…so I don’t want to. We are so good at making excuses and accepting them as to why we won’t get involved with something. The other day I was listening to a comedy act where the comic was so thankful to the people for coming out to his show. I feel this though has become far too true for many Church going families. We are so good at the excuses and the not doing anything that it is rubbing off on our children. But why is it so easy to work with high schoolers? Well it is not, but they want to be there! They are making that choice. They are the ones driving themselves or having their friends pick them up. But why is there such a change in just a few short years? Someone pushed those high schoolers to go and be active when they were younger…and they loved it. By going they find themselves apart of a great community and that community is one that stays with you for the rest of your life. The relationships that you make here are some of the strongest friendships that I have ever seen. But in the long run, they will look back and go…you knew what you were talking about all along.